Aga Khan signs Protocol with Ontario Government - Queens Park 2015-05-25 | Ismaili.NET - Heritage F.I.E.L.D. Premier Kathleen Wynne welcomed His Highness the Aga Khan to Queen's Park today for the signing of a historic Agreement of Cooperation between the province and the Ismaili Imamat. The agreement outlines areas of cooperation and joint initiatives, including leveraging diversity and culture as an economic driver and supporting a pluralistic approach to education. I want to tell you how happy and grateful my community and I are for this agreement that we have just signed. 25 May 2015- Toronto, Canada –His Highness the Aga Khan and Premier Wynne signed an agreement between the Province of Ontario and the Ismaili Imamat that sets a blueprint for cooperation in a number of areas including culture and education. The partnership combines Ontario’s excellence in education, green energy, health care and other key areas with the Aga Khan Development Network’s vast global experience in bringing sustainable development to societies living in diverse cultural and geographical environments. Under Monday’s agreement signed between Premier Kathleen Wynne and the Aga Khan, Ontario will grant university or college tuition waivers to 30 high school graduates of Aga Khan academies in Kenya, India and Mozambique over the three years starting in the fall of 2016. KARACHI: Aga Khan and premier Wynne signed an agreement between the province of Ontario and the Ismaili Imamat that sets a blueprint for cooperation in a number of areas, including culture and education. The partnership combines Ontario’s excellence in education, green energy, healthcare and other key areas with the Aga Khan Development Network’s vast global experience in bringing sustainable development to societies living in diverse cultural and geographical environments. TORONTO - The Ontario government has signed an historic Agreement of Cooperation with the Aga Khan. The spiritual leader of Ismaili Muslims met with Premier Kathleen Wynne during a visit to Queen’s Park Monday. Wynne later joined him for the inauguration of the Aga Khan Park located on Wynford Dr. in Toronto. 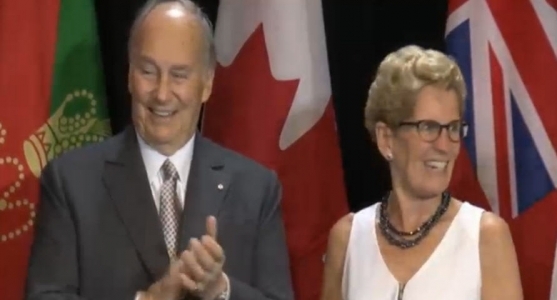 Wynne said they agreed to collaborate on mutually-beneficial education initiatives. “This includes exploring a full range of curriculum-linked resources that promote diversity, tolerance and understanding,” the premier said.